Boys’ dressing gowns from 2 to 12 years. 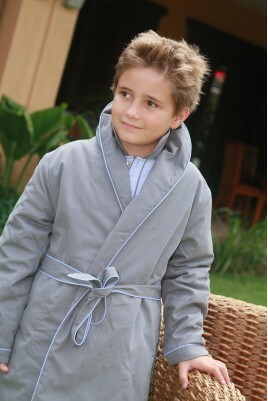 L'Orangerie dressing gowns for boys made from 100% cotton poplin and 100% Pe inside fleece for unrivalled softness. In grey or blue versions, with a shawl collar and wraparound style, held in place by two buttons, they are cosy, comfortable and very high quality! Take a look at our range of dressing gowns below to keep boys snug and warm in the softest cotton! Boys’ Dressing gown There are 3 products.